The holidays are here! If you’re anything like the New England Coffee family, your most memorable times during the season are spent around the table, sharing great food (and coffee!) with loved ones. When it comes to gift giving, we think some of the best gifts are the ones you make. This season, we found some great recipes and craft ideas that make thoughtful gifts for your neighbor, mailman, teacher and anyone else in-between. Baking is such an essential part of the holidays. The smell of cookies baking in the oven is unbeatable. You may have your go-to holiday recipes you bake every year but we think these festive cookies are going to become a new tradition. Are you a chocolate person? If so, we have a gift for you. These Intense Dark Chocolate Mocha Latte Cookies are too irresistible to pass up with three different types of chocolate and coffee! We think our Chocolate Cappuccino coffee is the perfect match for these decadent treats. ‘Tis the season for all things eggnog! Eggnog is one of those beloved food traditions that make the holidays complete and these Eggnog Cookies are going to become your new favorite, especially when paired with a cup of our Eggnog coffee. If you’re looking for a quick and simple last minute gift, these Peppermint Chocolate Spoons are so quick and easy that the kids can do all the work! 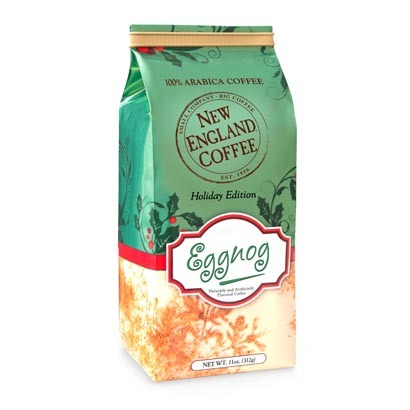 Pair it with a bag or single serve box of New England Coffee and you have a gift anyone will enjoy. Check out these easy instructions for Vanilla Latte Soap, French Vanilla Coffee Candles, and Mocha Mint Coffee Body Scrub. Not only do these look really impressive by themselves but if you combine all three with some New England Coffee, you have the ultimate spa themed gift basket! We hope these recipes and craft ideas inspire you this holiday season. To all of our extraordinary coffee lovers out there, we hope you have a very merry holiday season and the happiest of new year’s. See you in 2017!